1/ Ako sa cítiš po 10 mesiacoch hrania rugby? Hrali ste v Maďarsku a nedávno proti RK Bratislava.Čo ti to dalo? After 10 months of rugby, how do you feel? You’ve played in Hungary and against RK Bratislava recently, what does it bring to you? I feel very great, really glad to have the opportunity to try rugby. 2/ Bol ste jedným z prvých hráčov v Piešťanoch, aké je tvoje postavenie v tíme, hlavne pred novými hráčmi? You were one of the first players in Piestany, what is your current position in the team, and especially in front of new players? It certainly brought me a lot of experience, but also fun in my position, as vice-captain. As well, very amazing being in the scrum and in the line out. 3/ Piešťany privítali mnoho hráčov, niektorí odišli, niektorí zostali,.Čo ťa drží pri tomto športe? Piestany has welcomed some players, some left, and other stayed. Why does it make you continue this sport? I really like rugby, and I wanted to stay. 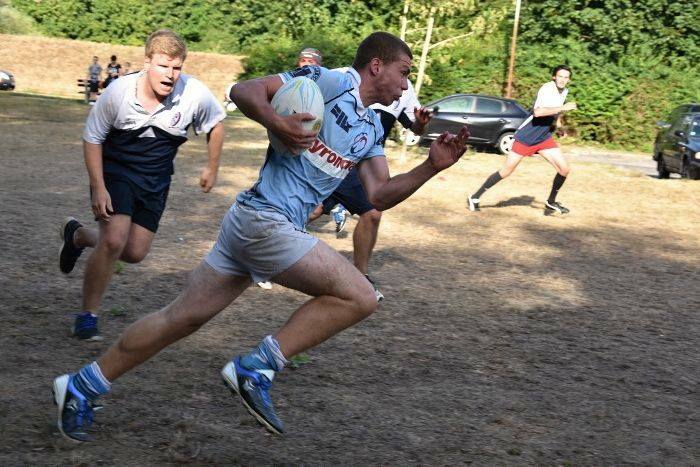 4/ Aký je rozdiel medzi tréningom a skutočným zápasom rugby 7s? What are the difference between the trainings, and the rugby 7s ? I personally liked rugby, and definitely recommend it to everyone, or at least to try it. Trainings are made for testing different combinations, and any possible situations. But in match, it’s different, more stress, pressure, and less creativity. Whatever we do, we learn a lot during matches.